The golfer on your Christmas list will love this sporty personalized Golf Ball Snowman ornament, and you’ll score a hole-in-one gift when it’s customized at no extra charge! Detailed to a “tee” and festive as can be; we’ll add name and year for a custom gift. Specify name; limit 1 line, 10 letters/spaces. Resin. Personalized Christmas ornament measures 4" long x 3 1/2" wide. I WOULD BUY THIS AGAIN FOR MY FRIENDS THAT LOVE GOLFING. IT IS A CUTE SNOWMAN WITH A GOLF CLUB IN HIS HAND. WHEN YOU LOOK AT IT, IT WILL PUT A SMILE ON YOUR FACE. IT IS BRIGHT AND FULL OF CHEERFULNESS. This ornament is a Christmas gift for my son who is a golfer. It is perfect! 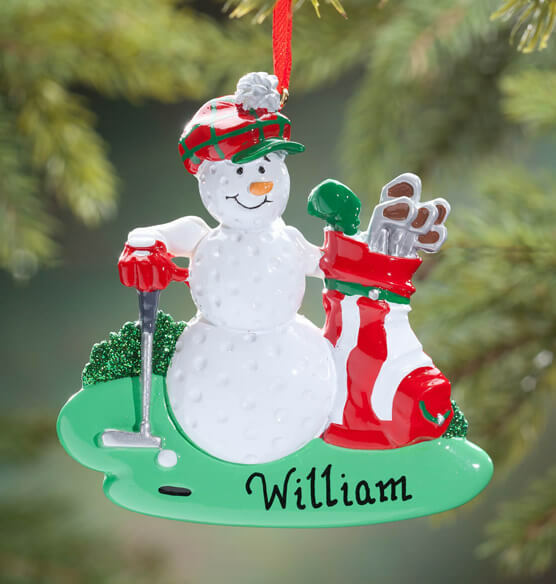 This ornament is just an added something to go along with other Christmas presents for a new golfer in our family. Perfect for the golf lover. Great gift for golf crazy friend. This was a great christmas gift. This little snowman was a perfect representation of our grandson. Just chillin' on the golf course. Well made, bright colors and good size. Great for Teenagers or golfing fans.